An Inhuman who can predict the future, Ulysses, has appeared. After one of his predictions led to the death of James Rhodes aka War Machine, Tony Stark heads to New Attilan and kidnaps Ulysses to learn the truth about his power. 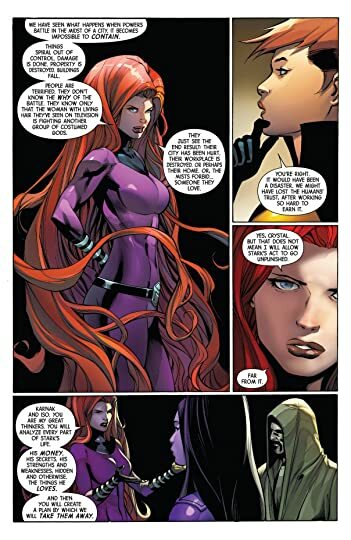 This did not sit well with Medusa and the other Inhumans an New Attilan is it's own nation and kidnapping one of it's people would not be tolerated. Medusa sets plans in motion to ruin Tony Stark's personal life, but chose to avoid a full on war. 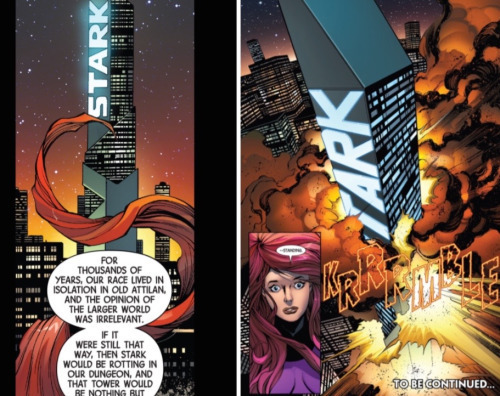 That didn't sit well with some Inhumans who decided Stark must pay dearly and he does when Stark Tower is destroyed. New Attilan versus Tony Stark begins. Uncanny Inhumans Civil War II was solid overall. I enjoyed it, but I was expecting something else. The majority of the actual fighting between the two sides is minimal and many of the key moments don't even take place in the pages of Uncanny Inhumans. That being said the last chapter made up for a lot of what was lacking. Medusa was being very conscious about how she handled Tony Stark's act of war by coming into a foreign nation, I know they are basically in Manhattan, but still a foreign nation, and kidnapping one of their people. Tony came off as quite the self righteous jerk in this volume to me. He acted as though starting an international incident is no big deal.